A common slogan in religious apologetics is to claim that a-theists do not really understand what theism is, and that most atheistic critiques of theism hit the wrong target. Such criticisms have been expressed by apologists such as David Bentley Hart in The Experience of God, and Randal Rauser in “Atheists Who Don’t Know What They Don’t Believe In.” Among others, philosopher Daniel Linford has responded to this talking point in his article “Do Atheists Reject the ‘Wrong Kind of God’? Not Likely.” Moreover, such a critique misses the mark, since, even if the average atheist on the street might not have the most extensive knowledge of theology when put on the spot, there are plenty of professional atheist philosophers, such as Graham Oppy, who respond precisely to theological arguments in works like Arguing About Gods. But what is this objection really all about? Sure, if we were to ask medieval theologians like Anselm or Aquinas (who owe much of their ideas to earlier Pagan philosophers like Plato and Aristotle), we might get a definition similar to that. But, can this really be taken as descriptive of how most theists, particularly those devoted to particular religious traditions, such as Christianity, would define “God”? Furthermore, do we see this understanding of God reflected in the earliest traditions of Christianity, before the writings of theologians centuries later? Not really. In placing God literally in Heaven, above the Earth, Paul (one of Christianity’s earliest founders) is clearly understanding God as “something posed over against the universe,” despite whatever arcane philosophical verbiage later theologians like Hart want to use to defend Christian theism in modern times. A lot of atheists, thus, tend to dismiss the theologian’s God as unreflective of ordinary theistic beliefs. For the most part, I agree with them. But, theologians are theists to, and if an atheist wishes to be robust in denying every kind of theism that exists, including the most formal and articulated version of the theologian’s God, then they need to be familiar with why atheist philosophers disagree with the theologian’s God as well. Frequently, apologists try to distinguish between the monotheistic conception of ‘G’od and the polytheistic ‘g’ods, as though they were entirely unrelated. An atheist states that she does not believe in the God of Christianity for the same reasons that she does not believe in Apollo, but then the apologist respond that this is not the correct conception of theism. First, I wonder if these supposedly different conceptions are really as disparate as Hart thinks. After all, in the Christian Bible, Yahweh is depicted flying in a chariot (Ezekiel 10), in a manner not terribly different from Apollo. Moreover, when Hart defines ‘G’od as something that is “omniscient, omnipotent, omnipresent,” these attributes are reflected in Apollo as well. Apollo has knowledge of the future (omniscience), miraculous powers (omnipotence), and is able to appear to appear suddenly mortals, no matter where they in the world (omnipresence). I suppose a difference could still be identified, based on the prefix omni-. After all, even if Apollo knows the future and can perform miracles, that does not necessarily entail that he is all-knowing or all-powerful. Perhaps it would be more accurate to say that Apollo is super-potent, super-knowledgeable, and super-present, but not quite omniscient, omnipotent, or omnipresent. But these are still heavily related concepts. I can see why Hart would want to distance himself as much as possible from the concept of ‘g’ods, since most people do not take the idea of polytheistic gods very seriously anymore. But these are hardly “two entirely disparate conceptual orders.” An atheist can deny both on fairly unilateral grounds. What is “a-theism,” then, if we define the concept of God and theism in this way? I would define myself as an atheist, and I think that my beliefs deny exactly the kind of God that Rauser is describing. I define my atheism as the view that no agencies exist that can meaningfully be identified with ‘G’od — in the sense of an ultimate agent cause upon which all contingent things are dependent that is immanent throughout the cosmos — or ‘g’ods — in the sense of immortal supernatural agents that inhabit the cosmos and rule over certain portions and aspects of it — either because the atheist believes a) that there is good probability that such agencies do not exist, or b) that the concepts of such agencies are ultimately incoherent, so as to rationally make impossible their existence, or c) that there is no evidence or successful arguments to establish the existence of such agencies. That is a definition of atheism that includes both ‘G’od in the monotheistic sense, as well as polytheistic ‘g’ods. Why do I not think that such agencies exist? First, because I think that the problem of agent over-detection often causes humans to project agency and personality onto otherwise impersonal and unconscious phenomena (for a further discussion of the causes of supernatural belief, including “counterintuitive agency,” see epistemologist Konrad Talmont-Kaminski’s article “Werewolves in Scientist’s Clothing: Understanding Pseudoscientific Cognition”, as well as Stewart Guthrie’s Faces in the Clouds) . After all, polytheistic gods who control the oceans, harvest cycles, and the heavens derive from the early human superstition to project agency onto natural phenomena. 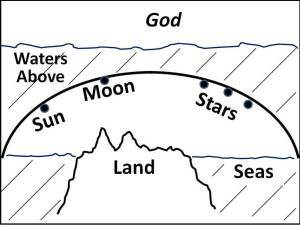 Hence why the ancients associated planets with deities, thought the movement of celestial bodies could predict the future, and sought to propitiate invisible beings to improve the weather. The concept of the monotheistic ‘G’od suffers from the same problem of agent over-detection, since it views things like the origins of our universe, or the necessary source of all being, as something that is an agency, or at the very least mental. The theologian’s God is nothing more than the projection of a sort of ghost (or Geist, if you will) onto the universe, or onto being and existence, or even onto how we abstract and conceptualize philosophy. If the ultimate source of these things, however, does not involve agency, and is something unconscious, impersonal, and reducibly non-mental, then the monotheistic ‘G’od does not exist. Most commonly (though not in all iterations of naturalism) naturalism is associated with physical materialism, in the sense that everything that exists is physical or can be causally explained through physics, so that physics can be said to be a causally complete picture of reality. I discuss some of the conceptual issues that arise when equating physics materialism with metaphysics in my essay “Science, Philosophy, and Placement Problems,” and I also identify as a physicalist. However, for the purposes of denying the supernatural, strict physicalism does not need to be appealed to, rather than some more minimal descriptions of naturalism. Naturalism sees no underlying consciousness, wills, or intentionality behind our universe, or the nature of being and existence. Instead, our ultimate reality is blind and unintentional . Hence, what is usually meant when something is said to have a “natural explanation.” Something that happens naturally occurs without any judgment or design, but as the result of mechanical forces. The universe was created for anything, it not designed for anything, nor is it moving towards anything. Naturalism predicts a “blind” cosmos (of the very sort I argue that we live in). At first glance this would appear to be a somewhat odd or arcane way of defining the ‘natural’, but Carrier is making a crucial metaphysical point about lower order versus higher order principles: naturalism entails that object or machine comes first, and mind second. Hence why most naturalists (including myself) are mind-body physicalists. There can only be natural consciousness from this understanding of naturalism if there is an object like a physical brain to support it. Supernaturalism entails that mind comes first, and object or machine second. Hence why theologians propose ‘G’od as an agency or consciousness that is the necessary cause for everything that contingently exists, such as our physical universe. They put a mind, will, or intentionality at the lower order level of our universe’s metaphysics, whereas in naturalism mental properties are emergent only at the higher order lever, and are in fact contingent upon lower order non-mental causes, such as atoms and bio-chemistry. This also gets back to the issue of religious belief and agent over-detection. Theists project agency onto otherwise primitive, lower-order features of being and our universe that naturalists argue are in fact impersonal and non-mental. Hence why the theist projects an extraneous ghost or Geist onto our universe, or onto being and existence, or even onto how we abstract and conceptualize philosophy. Denying this kind of theism is really quite simple. One is simply denying the existence of such agencies, consciousness, or Geist. This definition of the supernatural also captures polytheistic ‘g’ods as immaterial beings that inhabit and intervene in our physical universe. No such irreducibly mental beings exist. Only physical brains can support mental properties, and gods like Apollo do not have physical brains that they are contingent upon (otherwise they would be mortal, just as humans die when their physical brains deteriorate, since mental states are contingent upon objects or machines like brains). Furthermore, this definition of the supernatural also explains why things like souls or ghosts do not exist in naturalism, or even abstract intentionalities like Karma. All such concepts involve minds, wills, or intentionalities coming first, and not being contingent upon objects and machines. You cannot break a soul down into non-soul parts. But, in naturalism, you can break down natural consciousness by breaking down the physical structures that support such consciousness. I would add that miracles can also be caused by ‘g’ods like Apollo, and other supernatural agencies. However, I think that this definition of miracles fits in well with the distinction of the natural and the supernatural that I discussed above. Miracles involve irreducible agencies and wills, causally working from outside of the physical order, intervening in the physical order to cause occurrences that cannot be explained by causes within the physical order alone. There are also occurrences that result from causes solely within the physical order (in fact, they are the normal state of affairs, and thus non-miraculous); hence why the ocean can cause events like tidal waves, and I can catch an apple from a tree. But these causes within the physical order are incapable of producing the effect of the miracle. Hence why the molecules of Jesus’ corpse cannot cause him to immortally rise from death. Hence why the water molecules in a jar cannot explain sudden transformation into wine. Instead, an agency working from outside of the physical order (either God from outside of the universe, or Jesus within the universe, but still performing miracles through the power of God) is intervening to cause an occurrence that would be impossible within the physical order. This outside agency involves irreducibly mental cause and effect. It entails that mind comes first, and object second. Sometimes apologists will also claim that miracles cannot be proven through science, and that miracles can only be demonstrated philosophically or historically, but nothing could be further from the truth. Science is above all an empirical method. Phenomena like Jesus rising from the dead or turning water into wine involve demonstrable, physical change that can be empirically observed. Hence why apologists appeal to the testimony of people who (allegedly) saw them, because they would be empirically observable if people could see them. Parapsychologists, who scientifically investigate paranormal phenomena regularly, could find them too. It just so happens that no such evidence has been found, and instead, everything that is often believed to be a miracle tends to have a natural (object first, mind second) explanation. For this reason, I argue that miracles, like Jesus rising from the dead, involve paranormal phenomena (defined by the Parapsychological Association as “any phenomenon that in one or more respects exceeds the limits of what is deemed physically possible according to current scientific assumptions”), in the same sense that UFO abductions and Sasquatch sightings are paranormal. The ‘paranormal’ is not synonymous with the ‘supernatural,’ and can involve both supernatural and natural phenomena. Miracles may be supernatural, and UFOs and Sasquatches may be natural, but both could be empirically observed, and yet no such reliable empirical evidence has been found. I also argue in my essay “History and the Paranormal” that the historical method and ancient literary texts, in particular, tend to be unequipped for proving paranormal claims. This line of reasoning follows from historiographer C. Behan McCullagh’s (Justifying Historical Descriptions) discussion of the concept of “existing knowledge” and its relation to ad hoc assumptions. Ad hocness entails unproven (or untestable) assumptions that are being posited in order to defend a particular theory. Ad hoc assumptions can also vary by scale, and some involve more unproven assumptions than others. If I were to posit the ad hoc assumption that the spear in John 19:34 actually missed Jesus and did not pierce any part of his body, in order to defend, let’s say the Swoon Theory of the resurrection (I, for the record, do not endorse this theory and lay out my own case against Jesus’ resurrection here), then this would only be a particular, but not a general ad hoc assumption. It is not outside of our “background knowledge” that spear thrusts can miss their target, even if we cannot test if this happened in John 19:34 (if the passage is historical at all). But this is a very small ad hoc assumption compared to the amount of ad hocness that is involved in trying to prove a miracle like Jesus’ resurrection with ancient texts. This is because Jesus’ resurrection involves general assumptions about unproven phenomena, which are not even known to exist in our background knowledge, and not just a particular occurrence of a single event of such phenomena. It is not within our background knowledge (in parapsychology or medicine) that bodies have ever resurrected from brain death into immortal and imperishable bodies. The missed spear thrust only involves an ad hoc assumption about a particular event, otherwise belonging to general phenomena that is known to exist in our background knowledge, whereas a miracle like the resurrection involves general ad hoc assumptions about phenomena otherwise not know to exist in our background knowledge, before positing a particular event of such phenomena. For this reason, even the Swoon Theory (though it is far from the most probable alternative to the resurrection) still involves vastly less ad hocness than the Resurrection Hypothesis. In my essay “History and the Paranormal” I point out that historians cannot make arguments with good probability that are too ad hoc. This ad hocness can be increased not only by the number of the ad hoc assumptions involved, but also by the scale of the ad hocness. I also discuss in my essay “History, Probability, and Miracles” how the resurrection of Jesus involves far too many unproven assumptions to ever be proven with the current state of evidence, which consists solely of ancient texts (which are far from our most reliable kind of evidence, compared to modern scientific methods, forensics, journalism, etc.). It should also be noted that this reasoning would apply equally to natural paranormal phenomena. Natural paranormal things like UFO abductions, despite rumors of such occurrences, also tend to involve too many unproven assumptions to be argued for with good historical probability. In order to assume that a particular alien abduction had occurred, I would have to make the general ad hoc assumptions that aliens even exist, visit Earth, and occasionally abduct people. That is a way bigger ad hoc assumption than assuming that a particular person who reports a UFO abduction might be lying or mistaken (which is known to occur within our background knowledge). Such reasoning shows that doubting Jesus’ resurrection has nothing to do with a special bias against the supernatural. The same reasoning applies to purely natural paranormal claims like UFO abductions and Sasquatch sightings. Neither can be said with good historical probability, because history cannot be that ad hoc, especially when ancient texts are the only evidence that we have to consider. This provides purely historical grounds for doubting Jesus’ resurrection (or, at least, doubting that one can “prove” the resurrection with ancient texts), which, despite all of the discussion of the natural vs. the supernatural above, does not require the assumption of naturalism at all. Although I support a naturalist version of atheism, this need not imply that all atheists are naturalists, or that the concept of atheism and naturalism are inseparable. Philosopher Stephen Law has cautioned against defining atheism as requiring naturalism in his article “Secular Humanism: DON’T Define It as Requiring Naturalism,” and I agree. Law points to a PhilPapers survey that finds that 35% of philosophers who identify as atheist do not identify as naturalists. These atheists can hold different views about naturalism than I, and I would still consider them to be atheists. i. Behavioral. Activities undertaken for the sake of something, which may be either a state or further action. ii. Artifactual. Activities undertaken for the sake of producing an object of a certain sort (artificial). i. Formal. Biological developmental processes that occur for the sake of self-preservation or preservation of the species (form). ii. Functional. Parts of organisms that are present for the sake of the organism possessing them. The present essay maintains that agency-specific teleology (I) does not exist at the irreducible, primitive level in naturalism (there is no Platonic teleology that is the source of existence and being, or upon which everything is contingent), but does not argue that naturalism necessarily excludes Aristotle’s teleology pertaining to natural organisms (II). This entry was posted in Philosophy and tagged Atheism vs. Theism, Defining Atheism, Defining God, Defining the Natural, Defining the Supernatural, Defining Theism, Natural vs. Supernatural, What do atheists believe?. Bookmark the permalink. That was the most readable, succinct description of the matter I’ve ever read! If a dying god expired in a forest and nobody was around to see it, would it still make a sound? and empathizing with DJEM’s position on immaterial qualities (please god forgive me). The crux here is entirely DETECTION. Don believes in scientifically undetectable immaterial qualities, and to buttress their legitimacy in our shared reality he will 1st demonstrate our concept of ‘love’ as an IMQ. So this leads me to believe DJEM’s particular ‘love’ IMQ really isn’t one at all… because we can detect its source scientifically. “Love isn’t supernatural, it’s naturally detectable”, says I. So then DJEM shows me a xian who, if not a believer, would be a fall-down drunk who would probably kill somebody while driving to get booze. Don: “God works, see?” I would respond, “Yes Don, but this God is entirely a figment of the mind. His power is entirely psychological.” Don: “this man is naturally a drunk”. Me: “sure ok, but this is a sort of supernaturalism that doesn’t work very well outside of the noodle”. Don: “yes, but God is a detectable quality here”. Did Don circumvent the law by going IMQ with God? It’s all part of the xian “worldview” that Jesus works miracles like this all the time. Could Don’s worldview become palatable if he only went soft on his supernaturalism regarding miracles? The issue of miracles was an important part of that debate. Don’s definition of a miracle was not entirely clear to me. He seemed to include events that can have a natural explanation, but would simply be improbable, as miraculous. For example, the girl getting her pet parakeet back. However, if there was a 10% chance of getting the bird back and 1/10 people in her situation retrieved their lost pet, how is this a miracle? One needs to factor in confirmation bias when analyzing events that are simply unlikely. You can count 100 lottery winners as a miracle, but you also need to factor in all the losers. Now, if the event superseded the capabilities of any natural force or natural agent, such as the bird being restored to life after being incinerated, then I agree that that would be a miracle. But Don did not provide any scientifically or medically documented case for such a miracle. If you go with this ammo, you will only stop 1/3 of the xian zombies coming at you. How about this: A rationalist’s description of the 3 types of miracles. II. The ‘good break’ type of miracle. An event, when viewed by those outside of the recipient’s privileged position, that can be rationally explained as an arbitrary or chance occurrence. III. A sincerely regretted transgression that is truly forgiven by another. Well, example 1 is a solid case for a miracle, but 2 and 3 can both occur naturally. Sure, we can all count unlikely events and forgiveness as “miracles,” but it does not demonstrate the supernatural component of theism. I’d call the first a ‘literal’ miracle, but the second and third ‘figurative’ miracles. Reblogged this on Civitas Humana and commented: This (older) article was just thoroughly expanded and revised on Κέλσος, so that it is now up to speed with the current research of AdversusApologetica on metaphysics. Since this topic relates heavily to recent posts and discussion on Civitas Humana, I thought that I would reblog it here as well. The article, in part, discusses the definition of naturalism vs. supernaturalism, but the major contribution that it provides is its definition atheism vs. theism, which hasn’t been discussed previously on Civ. The article discusses both the theologian’s monotheistic conception of ‘G’od and the ancient idea of polytheistic ‘g’ods, and provides a definition of atheism that denies both. P1. No-thing exists without having detectable properties. P2. Even a thing which is currently undetectable must be detectable somehow to qualify as a “thing”. P4. Self-detection requires a dual state consisting of object and subject. i1. from p3. & p4., consciousness entails awareness of object and subject. P6. Being entails consciousness, as does the category of “Is-ness”. i2. from i1. p5. & p6., consciousness nullifies any non-duality entailed for the greatest possible theological entity. P7. All detectable entities are objects. P8. All objects are physical. P9. All that is physical will degrade when the final stages of entropy occur. P11. All that is detectable is subject to total entropic heat diffusion. i3. from p7-p11, the best possible theological entity must eventually lose heat/radiation along with all other entities/objects. eternal being. Without eternal being, omni-qualities are nullified. Tl;DR, Greatest possible deity must be observable. All that is observable is material. All that is material will lose cohesion when final stages of entropy produce a cold void. My last “logical thought flow” about one of your posts regarding “…when do contemporary or early sources matter…” was not academic, but perhaps you will have time to look at this new one. Glad you are posting new stuff.